At one time there was a gate in the fence to provide access to the cemetery. Someone has nailed it shut. The creek bank is too steep to provide access to the cemetery. The shrubs are about 8-foot tall. It is not too difficult to get through the shrubbery. 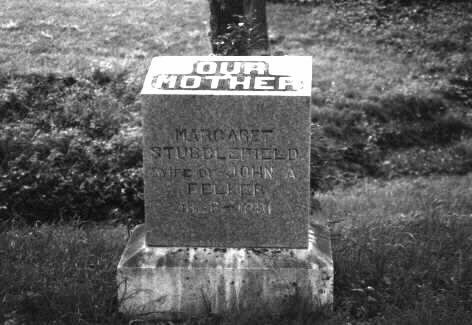 Our Mother, Margaret Stubblefield, wife of John A. Felker, 1828 - 1890. This cemetery covers about ¼ acre of land. It is fenced on 2 ¾ sides. The west side is a small creek. The setting is very peaceful with several large trees and birds singing. There is a family area on the north side of the cemetery marked by curbing. The area is large enough to contain 10 or 12 graves. There are no stones inside the curbing. Records say there are about 9 graves here. Someone is maintaining the cemetery.